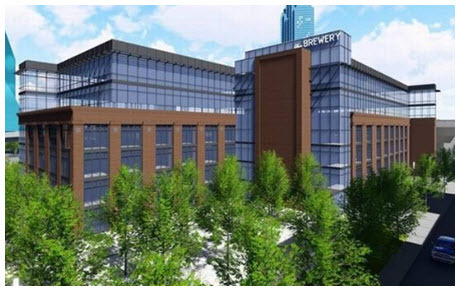 ​DALLAS - Developers have rethought their plans to tear down the historic Brewery building in downtown Dallas. The 100-plus-year-old building in the West End district will instead be rebuilt as part of a high-rise apartment and office project. Provident Realty Advisors, which bought the Brewery in 2013, plans to add two floors of office space on top of the four-story existing structure. It will construct an apartment tower and parking garage on the west side. About 180,000 sf of office space is planned in the building at Houston and Continental St. next to Victory Park. Provident hopes to restore the original brick exterior on the first four floors and add larger windows. "We are planning a 15-story apartment building in the parking lot and replace the surface parking in the new parking garage," Provident CEO Leon Backes said. "We will have a courtyard between the Brewery and the new apartments." Provident is hoping to catch the wave of development of creative office space that's spreading in the West End.